Waiter's Friend - Sommelier Knife - Wine Key - The best wine opener! The best corkscrew is a waiter's friend. Thanks to a brilliantly simple conceptual design, the waiter’s friend corkscrew is by far the most widely used wine opener in the world. It is without the shadow of a doubt the highest ranking on any list of preferred wine opening tool among professionals and wine enthusiasts anywhere. A waiter’s friend, also called a sommelier knife or wine key, is a corkscrew in a folding body in the same way as a classic pocket knife. 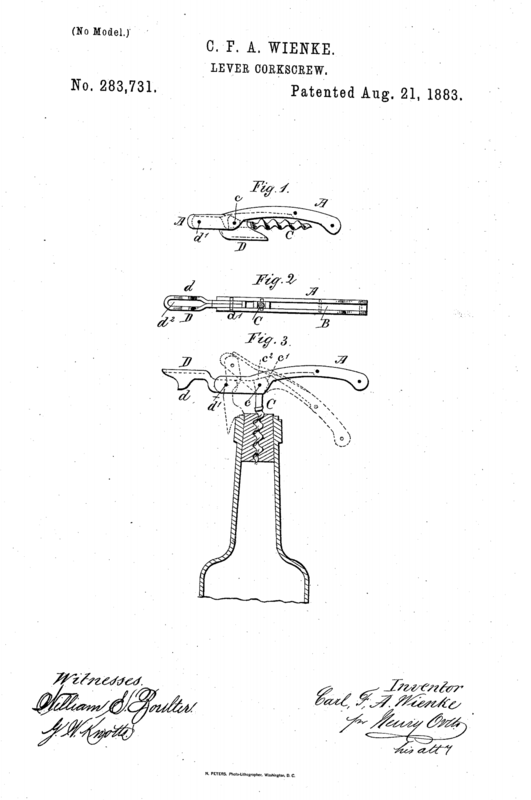 The basic design of the waiter’s friend corkscrew was invented and patented by German Karl Wienke in 1882. It has since proven its worth alone by its dispersion. Several tests and reviews in various media touching the topics around food and beverages constantly point out the waiter’s friend as the winning corkscrew design. The design is simply so thoroughly proven and unsurpassed. The only major design change to the original happened when the screw was replaced by the much better spiral. How to use a waiter’s friend? You unfold the spiral and screw it into the cork, just like with any other type of corkscrew. A lever arm, placed at the end of the body of the corkscrew, will grip the edge of the bottle neck thus serving as a leverage tool pulling the cork out from the bottle neck. The waiter’s friend wine opener is highly efficient and in a trained hand it is proven to be a very fast piece of serving equipment. The sommelier knife is significantly faster in use than the classic winged corkscrew. Ever since the original design there has been a foldable knife in the end of the body opposite to the lever arm. This knife serves as a foil cutter making it a three-in-one tool. This way, you don't need to look for a separate foil cutter. Which corkscrew is the best? The answer is quite simple: the waiter’s friend. If you ask wine lovers all over the World, nine out of ten times the response will be the waiter’s friend. You will find a large selection of waiter’s friend corkscrews here and certainly there is a corkscrew for every budget and personal taste. With inspiration from the Laguiole waiter’s friend Italian design company Legnoart has created a series of corkscrews that is delivered in great gift boxes. Waiter’s friend corkscrew in wood, metal or horn is also to be found among these beautiful wine openers. The French also knows how to make great wine openers. The manufacturer L’Atelier du Vin is showing their vast selection of various styles of Wine Waiter’s Friend corkscrews. Where to buy a waiter’s friend? Wineandbarrels is among the largest dedicated retailers specialised in equipment for your wine in Northern Europe. Based in Denmark, we have a large selection of wine openers and corkscrews to accommodate any preference from our many customers all over the World. Another more commonly used name is “Couteau de Sommelier” which means a sommelier knife in English. Besides the clever three-in-one design, the waiter’s friend is applauded for the small size. Folded together, a good corkscrew should not take too much space in a pocket, and you have all that you need to open a bottle of wine within reach. In our blog, our in-house sommelier, Michael Kahr Jorgensen, has set out on a mission to find the best corkscrew. In this article, called “Which is the best corkscrew?” you can see the result.